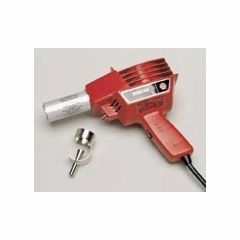 This lightweight, quiet Heat Gun is a pleasure to use! Designed for use with all types of thermoplastics. Heating element is rated to 650 degrees F (343 degrees C) and uses only 4.5 amps. An upgrade element is available to increase temperature range to 800 degrees F (427 degrees C). Two voltage levels are available. The 120 volt model comes with a three-pronged plug. The 220 volt international model requires plug adaptation. Pinpoint nozzle sold separately. Includes a bench stand for hands-free use. Asbestos-free.